Yesterday my friend and I were talking and I shared my freakish fear of the octopus. Whenever I'm in the ocean and begin to wander into waters where I can't see a thing, I immediately begin to imagine a giant octopus lurking around ready to seize and squeeze and take me down. Sometimes, get this, I even imagine it in the pool. Sometimes, it gets so strong I have to get out the water. But usually I don't because I know my fear is bogus. There's good, valid fear that keeps you safe and then there's what I call FAKE FEAR. Fake fear is the kind you need to have a face to face with, a sit-down. Here's how my "sit-down" goes in the water (it's more like a pep talk): "Stella, look at how beautiful the water is...such a nice day...la di da, la di da, ahhhh, doesn't that water feel amazing...there's no one here but your friends and little fishies, you are safe." Now this is quite embarrassing. But but because our brains all work alike, I bet you have your own fun batch. What's really scary is when these fake fears disguise themselves as the real thing. This is my warning to all of you. When it comes to your dreams, beware of the FAKE FEAR. It's ugly and will take you down. I've spent over six years training entrepreneurs and shaking off this fake fear. Now that you've met my octopus, take a fresh look at whatever is keeping you back in life - in your career, your relationships, or whatever. Is it a fake-out? If it is, have a mini session with yourself. Don't be mean or angry. Just say, "thanks for sharing, but I think I'm going to do X anyway." My "fake fear" is when my husband and/or children are away and I worry about what would happen if they were to be killed and I never saw them again? It's not a paralyzing worry and I think it's somewhat adaptive because it means that I always send them off well (with kisses and snacks and love) and it makes me think about would I be strong enough to carry on. Well of course it would be horrible but of course I would be strong enough. So then I think about your octopus. Is it at all adaptive? Is it at all helping you to envision fighting off that octopus - that even if that octopus was in that pool (?!?!?) that you would still be able to escape and rely on yourself and the others around you for help and support? Lisa, that is a fascinating observation that I never explored. Is this fear in some way a practice readying me for some possible atrocious monster? I have to admit that I have the exact same fake fear of you. 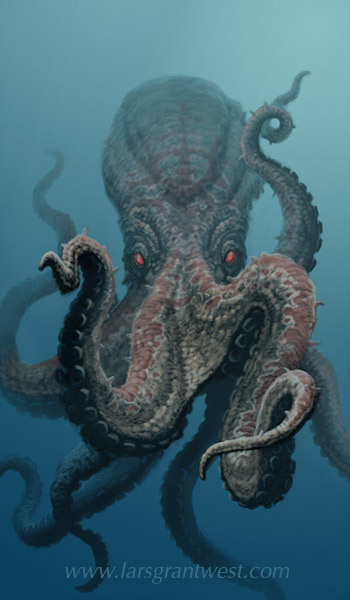 I can't go swimming in pools alone because i keep imagining some sort of giant octopus will be there when i can't see. and don't even get me started with the ocean. But I have been gradually trying to over-come it by forcing myself in those kinds of situations. Glad to know I'm not alone. Thanks! whow, and I allways thought I was the only one with that HorrorVission. I guess it started when I watched this cheap B-Horror Movie when I was very young (about a Killer-Kraken). So, as a kid, I was terryfied by deep, dark water. As a Result, my Parents sent me on Week-Ends into a swimming school. NIGHTMARE! There were all those, older, fitter, taller kids, but NO ONE swam as fast as me, 'cause I allways swam for my life, expecting an attacking Octopus pulling me underwater every moment. Well, today ofcourse I love swimming. It's very nice to hear that this is so imaginary, and that this level of fake fear manifests itself in other people as well.